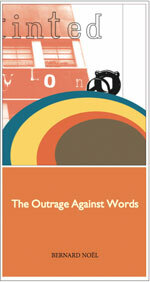 Bernard Noël's pamphlet The Outrage Against Words (as it's translated in 1978) has seen a multiplicity of afterlives. Originally written in 1975 following the infamous attempted censorship of his spectacular Le Château de Cène, the manifesto asks: How can one turn their language against them when one finds oneself censored by one's own language? First appearing in Paul Buck's remarkable Curtains magazine before being picked up by the parallel political effort in the L=A=N=G=U=A=G=E journal, the work was appended to the Atlas Press translation of The Castle of Communion in 1993, and most recently surfaced in Jed Rasula and Steve McCaffery's UbuWeb-like tome Imagining Language (2001)—each reading changes it, according, of course, to the immediate state of the reader and his social context, but equally according to the relationship of these components with those which exist at the moment of the book's composition. In every instance, the writing opens paradoxically: Screams. They begin again. I hear them. Yet I hear nothing. A meditation on the politics of erasure and potential of expression introduced through the impossible figure of the written cry. Perhaps one writes to erase? Noël struggles against bourgeois silencing—the encyclopedic 'outrage against words' that acts both through words and against them. The police are even in our mouths. A penetrating defense of polysemia, The Outrage Against Words is essential reading for the state of language and the politics of play.